Although appearing basic, a dish rack comes handy in organizing the kitchen space and minimizing mess. 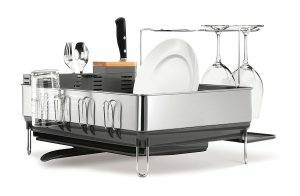 Dish rack comes in different designs and slots to accommodate pots, plates, cups, glasses, saucers and other utensils. It serves as a holding point for utensils and also conserves space. One of the key challenges people face is identifying which product is right for your needs. While a large rack may hold more utensils, it may occupy too much space. A small one may be more portable and compact but may not accommodate large or too many utensils. To help make the right decision, we identified the top 10 best dish racks in the market. But before diving into the review, do you know what to look for in a dish rack? Capacity: It’s paramount to first understand your needs before buying an item. The best dish rack isn’t too large or too small. Material: Due to proximity to water and moisture, dish racks are exposed to rusting, corroding, fading or losing their appeal. A good accessory is made for durable, corrosion/rust-resistant and tarnish-free materials. Space: While a large accessory will fit more utensils, it may occupy a lot of space in your kitchen. On the other hand, a small unit may take little space but will be overwhelmed by many utensils. It’s vital to choose while focusing on the available space. Design: The best rack for your dishes will feature good styling that enhances the surrounding. You can go for contemporary or classic designs. Durability: Dish racks will be knocked against other objects, fall down and are exposed to soap and water. The only way to be guaranteed of long life is going for long-lasting items. 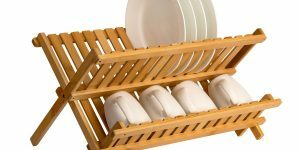 Made from durable and elegant bamboo is the SONGMICS dish rack. This folding rack measures 16 x 9 1 /8 x 9 3 /4 inches when open and can hold mugs, plates, cups, glasses, bottles, and . Its collapsible nature boosts its portability while the X-Shape design provides a firm holding point. This beautiful product unfortunately feels a bit flimsy especially when heavy objects are placed on it. 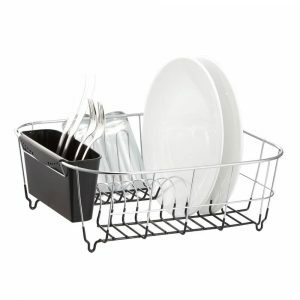 Drying medium and large utensils isn’t a problem with the Evolution dish rack by Rubbermaid. It comes with large slots that can hold cups, pans, pots and other utensils vertically or horizontally. The stylish accessory comes with treated surface that inhibits microbes, odor-causing bacteria, stains. The slots may unfortunately be a bit too big for small plates and dishes. 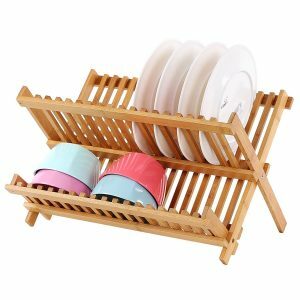 This unique rack can accommodate dinner plates, dishes, saucers and many other utensils. It consists of 14 slots that allow the water to drain easily without messing the countertop. 5the bamboo product is also loved for its collapsible design that makes storage easy. While it scores well in regard to resistance to water and soap, this piece is a bit small for large plates. The Neat-O brand is among the t p names when it comes to dish racks. This is evidenced by this metal wire rack that measures 12 x 14 x 5 3 /4 inches. The stylish bronze metal is resistant to rust, corrosion and will retain it looks for many years. Also included are plastic silverware cup and small-size slots. If you prefer racks with slanted slots, then this vertical-slotted rack may not really excite you. If it wasn’t for its rather small size, this deluxe dish rack from Neat-O would have ranked higher. 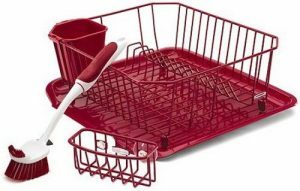 Nonetheless, it is still a good choice for drying dishes, plates, and related utensils. It comes in chrome-plated steel wire that is strong and also resistant to rust and corrosion. The small-sized drainer measures 12-3/4 by 14-1/4 by 5-1/4 inches and can hold 8 plus dishes and includes a removable plastic cutlery cup. The Neat-O over-the-sink dish drainer is suitable for most types of sinks. It is made from quality and sturdy wire metal and is coated with chrome for elegance and durability. Its compact size allows it to fit inside sinks measuring at least 13(L) x 8.27(W) x 4.92(H) inches and is light to carry when empty. With dimensions of 20.28(L) by 8.27(W) by 4.92(H) inches, this accessory is not very big and thus not suited for large utensils. 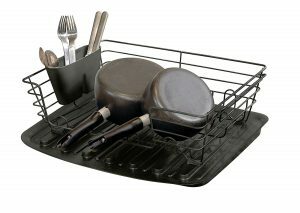 This metal dish rack comes with an innovative design that allows it to either sink-in or sink-out of the sink. It measures 14 (L) x 11 (W) x 5 1 /4 (H) inches and comes with a moveable storage caddy. 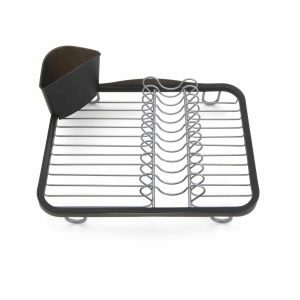 Looking for a compact and portable dish rack? Well, the OXO brand is proudly offering the convertible foldaway dish rack. The stainless steel product is designed for medium and large utensils including bowls, dishes, pans, pots and much more. It features a spout for redirecting water to the sink and foldout legs for better elevation. The built-in tines are meant for mugs, cups, glasses while the slots accommodate bowls and plates. It also includes removable utensil cups. Unfortunately, the small drain hole tends to leaves some water behind. It features a spout for redirecting water to the sink and foldout legs for better elevation. The built-in tines are meant for mugs, cups, glasses while the slots accommodate bowls and plates. It also includes removable utensil cups. Unfortunately, the small drain hole tends to leaves some water behind. To combat odor-causing bacteria, stains and other pathogens, the rack features MicrobanTM antimicrobial protection. The main con about this item is its fairly-thin dish dividers. This steel dish rack comes with innovative drainage system that ensures water from the utensils flows into the sink and not the countertop. This is boosted by the swivel spout that can be rotated in various angles. The rack is made from quality stainless steel and also includes a wine glass holder. To keep it clean and spotless, the rack’s surface is fingerprint-proof. Although steel provides durability, it can scratch the sink’s surface. The rack is made from quality stainless steel and also includes a wine glass holder. To keep it clean and spotless, the rack’s surface is fingerprint-proof. Although steel provides durability, it can scratch the sink’s surface. 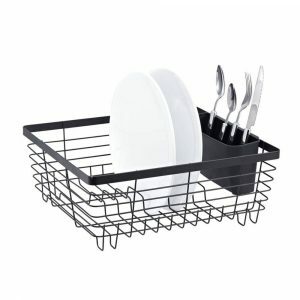 Drying your utensils whether cups, plates, glasses, saucers is easier with the right dish rack. This accessory will not only accommodate the utensils but allows them to dry without creating a mess. We identified the top 10 products that will make your life easier. They are made from strong and safe materials, come in elegant designs, and are well-constructed from safe materials. The racks are also quite versatile and can accommodate various utensils. 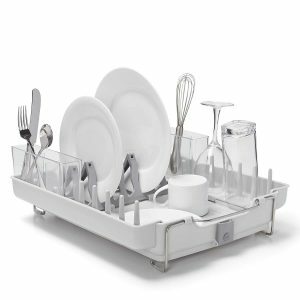 Any item on our top 10 best dish racks in 2019 review is bound to deliver maximum satisfaction and peace-of-mind. They are made from strong and safe materials, come in elegant designs, and are well-constructed from safe materials. The racks are also quite versatile and can accommodate various utensils. 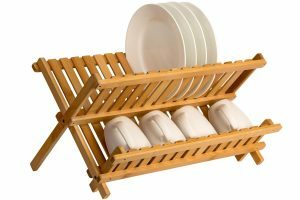 Any item on our top 10 best dish racks in 2019 review is bound to deliver maximum satisfaction and peace-of-mind.